Laid down as LST-1124, at Chicago Bridge and Iron Works, Seneca, IL. 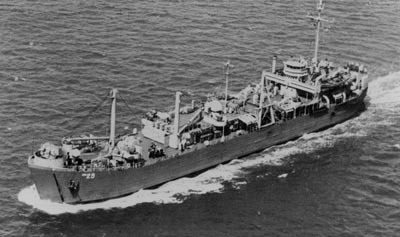 Decommissioned at Baltimore, 7 March 1945, for conversion to a Landing Craft Repair Ship at Bethlehem Steel Key Highway Plant, Baltimore, MD. Decommissioned, 1 January 1947, at San Diego, CA. Sold, 16 March 1962, to River Equipment, Inc., Memphis, TN. 33k USS Amphitrite (ARL-29) underway, date and location unknown. Harry Goff Felshaw, Seaman Apprentice, USNR-R.